FOLOLE 'TASI' TUILOMA GATOLOAI, 82 of Waipahu, passed away on November 19, 2018 in Aiea. She was born in Samusu, Aleipata, Samoa. She is survived by her sons Ala (Aso) Gatoloai, Afa (Sirao) Gatoloai; daughters Peaulele Tina (Tonu) Maualuga, Emi (Timo) Chan Kwan, Senaleva (Faafetai) Tuimalu, Upuia (Pisa) Auvae, Siuli (Vaeluaga) Afualo; 39 grandchildren; 28 great-grandchildren. 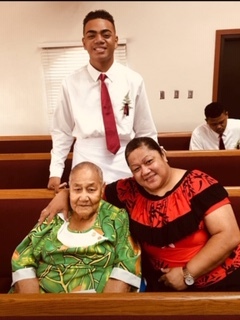 Visitation will be at 8:00 am on Friday, December 21, 2018 at First Samoan Full Gospel Pentecostal Church in Salt Lake followed by funeral service at 9:00 am. Burial will be at 12:30 pm on the same day at Mililani Memorial Park's cemetery. In loving memory of our Beloved Brothers Vea Gatoloai and Sinatala Gatoloai.